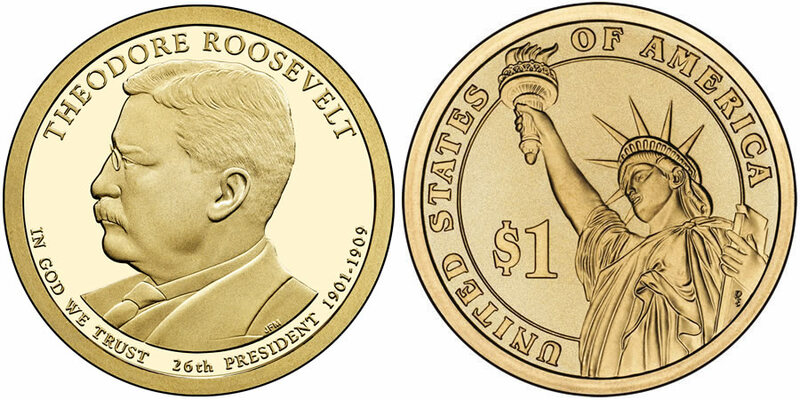 The 2013 Theodore Roosevelt Presidential $1 Coin is offered by the United States Mint as the second strike of the year in the Presidential $1 Coin Program. Shown on the obverse of the strike is a portrait of the 26th US President, Theodore Roosevelt. As such, this coin also marks the twenty-sixth in the program overall which debuted in 2007. The series features four new releases annually since that debut honoring the former Presidents of the United States in the order in which they served in office. Coins of the program were originally struck and released into circulation. However, stockpiles of $1 coins forced a cancellation of future circulation releases. Instead, the coins are now solely struck and issued for numismatic purposes. Theodore Roosevelt was the Vice-President when William McKinley was assassinated becoming the youngest person ever to serve in the office in September of 1901 at the age of 42. After a successful re-election, he continued as President until March 4, 1909. His tenure is noted for his "Speak softly and carry a big stick" international diplomacy policy as well as his efforts at conservation of public lands. Shown on the obverse of the coin is a portrait of President Theodore Roosevelt designed and executed by United States Mint Sculptor-Engraver Joseph Menna. Surrounding his portrait are the inscriptions of THEODORE ROOSEVELT, 26TH PRESIDENT, 1901-1909 and IN GOD WE TRUST. The reverse of all Presidential $1 Coins contains the same depiction of the Statue of Liberty. It was originally designed by Don Everhart and is surrounded by the inscriptions of "UNITED STATES OF AMERICA" and "$1." An edge inscription indicates 2013 and E PLURIBUS UNUM as well as the mintmark.